As Guy mentions the aim was to complete the picture in time for the Alzheimer’s Association International Conference 2017 – a tight deadline which helped us all focus. Ideas and concepts were initially sketched out with Guy and a small team and then shared with a wider group over email. Often the easiest way of sharing ideas and developing concepts is in face to face meetings so everyone can see the ideas emerge, make suggestions and get immediate visual feedback. However, the team were unable to meet so email was the best option. Happily the team were articulate and creative so the process was very positive from my point of view. The final image shows how all the different groups travel on a road into the future. 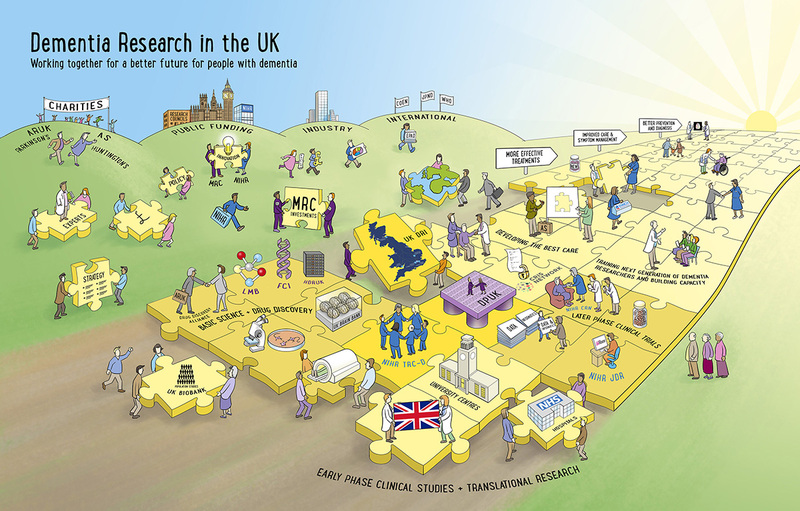 The different ‘jigsaw puzzle’ pieces of Dementia Research in the UK fit with together with less pieces missing as they move forward.